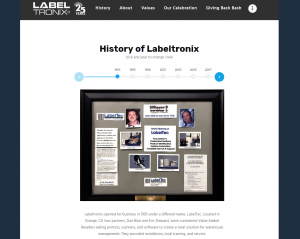 to learn more about Labeltronix. Today, we are Southern California's leading provider of labels for some of the country's leading brands. Labeltronix creates unique, crafted labels. Our labeling experts translate clients' brands for a public that demands the best and most appealing labels on the products they buy. We are responsive to the latest trends, including eco-friendly labels that are particularly well suited to products in the natural and organic products market. Labeltronix uses state-of-the-art presses to create standout labels. Your labeling project can be completed to perfection on our digital or HD Flexo printing presses. Our finishing equipment adds special touches that will set your labels apart, and distinguish your branded identity. In 2011, Labeltronix moved into its 50,000-square-foot state-of-art printing plant in Anaheim, California. The new facility was designed entirely with customers in mind. Decisions about maintaining top quality inspired how and where state-of-the-art printing technology was placed, and how it is operated. Labeltronix routinely wins top awards for the labels it creates for clients and is certified with the top international quality standard, the ISO 9001: 2008. Lean Labeling® is the trademarked Labeltronix program that represents a better way to design, manufacture and manage labels. It grew from our ability to put ourselves in the place of label-buying customers, and provide solutions for them. Our mission is to help companies make great impressions by providing high-quality, cost-effective labeling solutions, superior customer care, and establishing long-term, mutually beneficial relationships with our customers, employees and suppliers. Questions? Our label experts are ready to help point you in the right direction! We’re ready to send you samples of our wide variety of labels we’ve printed. Get a detailed printing quote from our sales team on your project today! Want to be in the know? Want to see what we’ve been up to? Stay in touch and be social with us! ©2019 Labeltronix. All rights reserved.